Iguazu Falls - explore the trails in this fabulous scenery of multiple cascades and waterfalls intertwined with subtropical lush vegetation and spiced-up by a myriad of rainbows. Getting around: facts and info. The Iguacu Falls adventure starts in one of the neighboring towns: Foz do Iguacu on the Brazilian side, Puerto Iguazu on the Argentina side and eventually in Ciudad del Este – a city on the Paraguayan side. Although Paragway does not share Iguazu Falls, the city being a large center for cheap electronics and all kind of contraband goods is often an “ending point” of the Iguazu Falls adventure. To enter the Iguazu Falls National Park (Argentina side) you have to pay a small fee of 85 AR pesos (no other currencies are accepted). Please stamp the ticket at the exit to save 50% of the entry fees the next day. 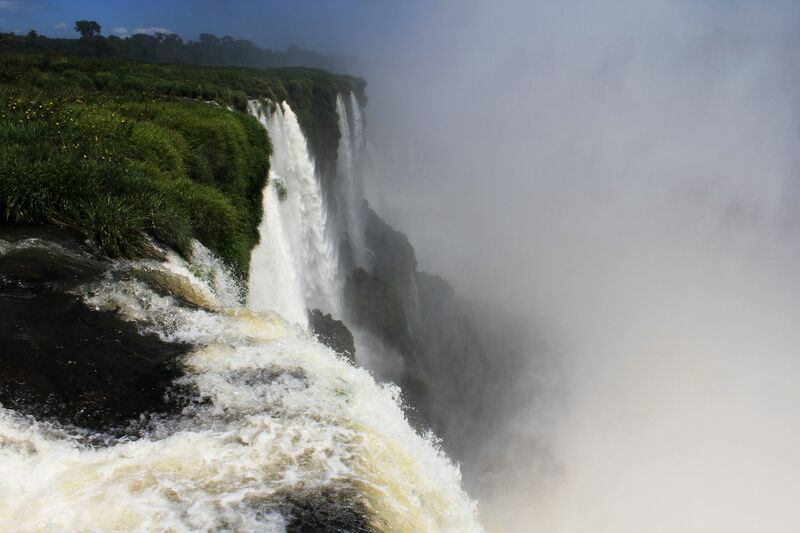 If you would like also to visit the Brazilian side of the falls (overlooking Argentine side of the Devil’s Throat) you will have to pay not only the Brazilian Park entry fees (about $14 US) but also (at least theoretically) get a Brazilian Visa ($140 for US citizens). You will not be charged however the entry fees to Argentina when coming back (US citizens $140 and Canadians $70) called the reciprocity fees. These you pay only once at the airport when arriving to Argentina. It makes it quite expensive. You will find however opinions shared on blogs that with a bit of luck you may get around some of these fees due to the short stay on the Brazilian side of the boarder. Grand Adventure Tour - view from the speed-boat approaching the Devil's Throat gorge in the Parque National Iguazu. Fascinating mixture of cascades of water, lush subtropical vegetation, gigantic boulders and blue sky......that is the Iguazu Falls National Park. It is a 1.2 km (about ¾ mile) long metal catwalk zigzagging over the upper Iguazu River. It is ending with the large platform offering the great view of the Devil’s Throat from the top. The gigantic amount of water plummeting down the crescent-shaped cliffs creates dense clouds of mist totally hiding secrets of the gorge from our eyes. Yet, from the above you can clearly see the beginning of the “Perfect Storm”. It will steal your heart and leave you with a sense of awe and serenity. The circuit is located quite far from the visitor center so the best way to get there is to take the Ecological Train (cost included in the entry fees). It runs every 25-30 minutes between the Central Station at the Visitor Center through Estacion Cataractas to the final stop at Estacion Garganta del Diablo. Those “hard-to-die” can take the trail meandering along the upper Iguaçu River and walk to the Garganta del Diablo catwalk in close contact with the wilderness of the Parque National Iguacu what may be awarding for bird watchers. You may also witness monkeys, tons of butterflies, lizards, coatis…. But in the burning heat and high level of humidity during the local summer it may be too exhausting experience. Keep in mind that you have to save your energy for all essential catwalks, footbridges, walkways and trails along the falls. It leads along the upper rim of waterfalls and islets offering the fantastic “from the above” views on all major waterfalls on the Argentina side. This is the place from where you will have a magnificent panoramic view of the Iguacu Falls. You will be admiring the fabulous scenery of multiple cascades and waterfalls intertwined with subtropical lush vegetation and spiced-up by a myriad of rainbows….. really breathtaking and out of this world experience. From here you can make spectacular pictures capturing the entire wall of waterfalls spread-out along the wide opening of the river and still focus on each individual one from the very short distance. It includes a series of walkways through the rain forest and along the lower Iguazu River. For most visitors it starts at the river level (as an ending point for the Grand Adventure Tour) and climbs along the cliffs to join the Upper Circuit. It offers fabulous close-up views on the waterfalls from their bases giving the true feeling of the might of tones of plunging water. Especially from the observation platform next to the Salto Bossetti you can live the sensations almost equal to those of being on the boat. Not only the thundering sound of the water roaring above your head, clouds of satin-like mist, but also splashes of heavy “showers” from time to time reaching the platform make it a real adventure. Farther up the path you will pass by Salto Dos Hermanos – twin falls of exceptional beauty and striking similarity. Departing point for both circuits can be reached by Eco-Train or by taking the Green Trail (Sendero Verde). It is a “short-cut” through the rain forest giving you the chance to see birds, butterflies and many other species although I will not bet on it. This path is very popular between visitors going to or from Lower/Upper circuits effectively sending “potential wildlife” away. Most likely along the path you will see families of coati (raccoon-like creatures). I hope this Iguazu Falls Info was useful and together with pictures and description gave you a pretty good idea where you are (or would like to be :-).